Just last week, rumors of Google's plans to spread Google Wallet beyond the virtual world and into the physical realm with an actual card made a surface breach. The so-called "Google Wallet card" would be accepted just like any other major credit or debit card, and would serve as a representation of a user's Google Wallet account. Users could tie any of the debit or credit cards in their accounts to the Google Wallet card, and whenever it was swiped, payment would be taken care of instantly. Instead of then having to carry around a litany of plastic payment methods, Google Wallet cardholders need carry just the one. 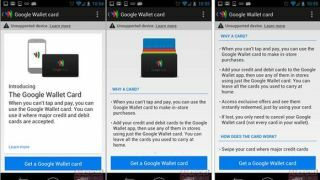 While the first reports came from an unreleased version of the Google Wallet Android app, the rumors grew stronger Tuesday when Google's own help pages made mention of the Google Wallet card. The first indicator came from an "Eligible Devices" tab, which described the Google Wallet card as being compatible with any device running Android 2.3.3 or higher. However, the references to the card didn't last long, and all mention of the card on the "Eligible Devices" tab was removed. According to the original report, users could access the Google Wallet app from their mobile devices to alter the payment card to which the Google Wallet card was tied. While there's still mention of a "Google Wallet Virtual card" on Google's help and terms of service pages, this is not the same as the physical card. Instead, the Virtual card is merely a digital card tied to the Google Wallet which is used for contactless payments to merchants. Google has remained mum on the subject of the potential Google Wallet card, but the evidence mounting presents a strong case the company will reveal something to touch soon. From the very detailed instructions and features found in the unreleased app to this newly retracted mention of the card, it's unlikely Google will be able to keep its plans secret for much longer. Perhaps Google is waiting until the iOS version of Google Wallet is up and running, but there's no date in sight yet, even though Google is currently accepting sign-ups for iOS version invitations. It would make sense since Apple's devices don't include NFC, and could make those customers the most likely adopters of a physical all-in-one card. Until Google offers up more substantial information, the dream of a single card unifying all other debit and credit accounts remains just that.